Waze isn't a game, not really, but I can't help using it like one. My wife gets viciously car sick when I drive, maybe because of how I drive. So she does a lot of the driving in our family, which leaves me with a lot of time to help her navigate and play games on my iPhone. Waze lets me do both. The basic premise of Waze is crowd-sourced navigation. The guts of the software provides GPS-enabled mapping shown to you in sharp, 3D graphics. The real genius of the system though is that it learns from the way you and others drive. It looks at how you get from point a to point b and how others get there and sees how long it takes and eventually decides which is the best route and tells you. It also lets you report from your phone on the fly. See a cop, a crash, a traffic jam, you can tap on your phone and turn it into a icon on the map that everyone can see. You can include details and even images. The best part? It rewards you with points that you can use to level up your little car. The car is shown not just on your map, but everyone's if you have the option turned on. That means other Waze users can see you stuck in traffic three cars back, or zipping by them on the highway. And they can see how cool your car is. The game also adds bonus items that it drops on the real road along or near your real route. Grabbing up these items (think the cherries in Pac-Man) is as simple as driving over them. All of these earned points add to your score, which not only give you more customization options but also powers the metamorphosis of your car. You move from a pacifier-sucking baby car to a shield-wielding car to, eventually, a crowned king car. The game-like mechanics of Waze are great, but they don't get in the way of the incredible usefulness of the app. I happened to be using it on our drive home from JFK Airport late last month when a mammoth snow storm hit the area. The free app started pinging away, telling me about standing water, slow-downs, car crashes. At one point an alert told me that a car a half mile ahead of us had been hit be a tree... on the interstate. I read it out loud to my wife and laughed it off. Half a mile later we had to move over to avoid the tree lying across half of the interstate. 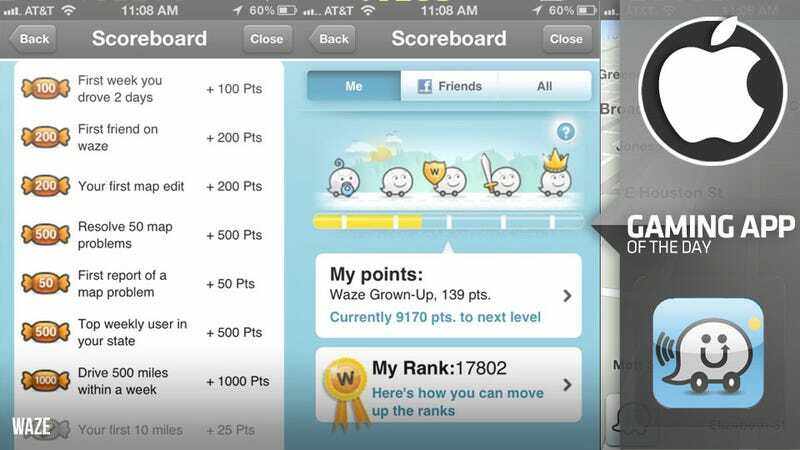 Waze is an amazing app, a blend of gaming, crowd-sourcing and navigation that makes it a pleasure to use and play with.